University of Cape Town (UCT) management has, once again, managed to shove its foot firmly within its own mouth. This time to the point where its toes are likely tickling its own tonsils. Hereâ€™s hoping they donâ€™t have athleteâ€™s foot. On the 22nd of July, UCT sent out an email explaining why they made a decision to rescind an invitation to journalist Flemming Rose, who was due speak at the 2016 TB Davie Memorial Lecture on Academic Freedom. Rose, controversial editor of the Danish publication Jyllands Posten, became infamous for his decision to publish cartoons featuring the Prophet Muhammad as a â€œterroristâ€. Rose has since become a vocal proponent of free speech, and whom many others believe to contribute to liberal defences of Islamophobia. While the decision to rescind the invitation is hotly debated, the justification and reasoning provided by Vice Chancellor Max Price, is what concerns me most. Itâ€™s a whole lot of wows. The first reason cited by Price expresses concern over Roseâ€™s presence inflaming campus conflict. Price, however, conveniently overlooks the fact that political tension and polarised ideologies are not new to the university space â€“ and they shouldnâ€™t be seen as necessarily bad. In fact, the live tension between free speech and ensuring the protection of discriminated peoplesÂ reflects the political flux of the world right now, and should thus be contextually relevant to us. In this case specifically, we might be interested in attempting to reconcile the importance of speaking out against right-wing extremist of groups, such as ISIS, while being careful of not encouraging the silencing and discrimination of Muslim communities. If such engagement cannot happen within a university space, then what purpose is the university really serving? Price also falls into the trap of painting protest action as something that necessarily interferes with academic engagement. This narrow outlook closes off our understanding of the university as a site for diverse and complex modes of intellectual engagement. Thereâ€™s also hypocrisy in painting protest action so narrowly. For example, at UCTâ€™s Thomas Piketty lecture on economic inequality, on the 30th of September 2015, student protestors entered the venue and stood silently holding placards in full view of the international audience. The placards highlighted that, while UCT spoke of inequality with a group of elites, it still practised the exploitative policy of outsourcing its own workers. Months later UCT celebrates their great achievement of welcoming those same workers as employed staff â€“ largely due to the efforts of those same protestors. Are we to believe that this was not meaningful engagement? Is academia secluded to the realm of cold halls where elite groups take part in inaccessible and formalised discussion? Is that how â€œAcademic Freedomâ€ presents itself? Do these Muslim extremists even go here? What makes the above all the more concerning is Priceâ€™s second justification for revoking Roseâ€™s invitation – that there exist violently intolerant factions within the local Muslim community. â€œWe believe there is a real danger that among those offended by the cartoons, an element may resort to violence. We are convinced his presence at this time would lead to vehement and possibly violent protest against him and against UCTâ€, Price said. Who on Godâ€™s overheating earth are these Muslim extremists in Cape Town? When has the Muslim community in the area ever displayed signs of political violence? Why would they want to resort to violence when most of us are shitting ourselves over the prospect that SA will start treating us like the West does? But worst of all, why is Price creating the context in which Muslims are being represented as violently intolerant, without allowing us the chance to present ourselves? While pre-emptively painting Islamic intolerance as homogenous across regions, Price is also feeding into global patterns of illegitimate fear mongering. Not ironically, this is literally how discrimination against people begins. And as Benatar points out, UCTâ€™s Academic Freedom Committee did not endorse Priceâ€™s decision. As a compromise, they reasonably proposed that would be valuable to have Rose debate other scholars who are critics of his work and actions â€“ ideally, I would imagine this to include respected Islamic scholars who themselves are deeply invested in freedom of expression, decry extremist ideologies and yet challenge Roseâ€™s vision of what freedom entails. Iâ€™d definitely go see that – placard in hand, of course. 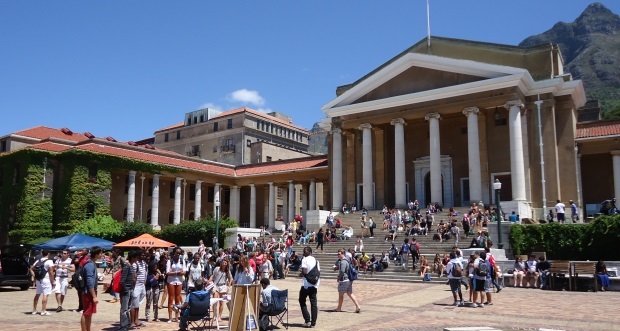 Patricia Lucas, from the UCT Communication and Marketing Department, said thatÂ the university regretted its decision but that risks had been identified around having the lecture at UCT. That at the time the invitation was sent out, the climate of campuses was less volatile and much quieter than what it is now. Max Price and his executive team, flawed as they may be, are not ignorant or irrational folk. So given the absurdity of his rhetoric and justifications, a final question must be asked â€“ why is he trying to sell us these nonsense reasons? And why does he so easily throw Cape Townâ€™s Muslim community under the bus in doing so? Here is an article full of ignorance and conjecture but short on facts, not unfamiliar to readers of this site. Max Price did not mention Muslims as threatening violence. And there are whole set of other issues which are not transparent and not mentioned in the statement but which would disabuse your write of his ill-formed opinions. The Daily Vox has published your articles, however? It is my view that a good news site fairly represents a range of perspectives. I am only an intermittent reader but I like to see a variety of respectful views supported. Suggestion: when you comment, state what a situation is, not simply what it is not. Also, you essentially make no point unless you make an actual point, instead of simply alluding to it and attacking the author’s interpretation. Shuaib. what is that you are saying? Your pompousness knows no bounds. The editor of this article needs to stick its toes in its mouth. A article full of nonsense and bias report! I think it is vital to also remember that along with the prophet mohammed cartoon, a number of others were published (including one which mocked the newspaper itself). The publishment of these cartoons was clearly not an endorsement of their views but rather just an attempt to fight back against the self-censorship Rose had identified in the media. For those who claim he is Islamophobic, it must be asked then why he would come out in support of a conservative muslim cleric’s right to preach anti-democratic speech. He is not some far right hateful racist, rather he is a classical liberal who understands that A). Everyone has the right to free speech and subsequently B). No set of beliefs is beyond criticism or questioning. The violent activity of the “fallists” and the #FeesMustFall groups —illustarted through 2015 when millions of rands of damage was inflicted on the campus in the name of “transformation”—shows that there is a wholly unpredictable and unreasonable cohort of students at UCT whose intolerance can turn into destructive activity at the drop of the hat. Those who condemn Dr. Price for rescinding the invitation refuse to accept the fact that a small but destructive group UCT students have succeeded in making the campus an unsafe space for free academic discourse. Dr. Price is in the unenviable position of having to predict what speaker or public activity might be too much for the radical groups on campus to tolerate. Can this writer truly say he can guarantee the safety of the speaker and the attendees? Give that in the past 12 months protesters have burned busses and paintings, invaded residences, brought the university to a standstill, threatened the welfare of students and staff, and firebombed the office of Dr. price himself, this is a purely pragmatic decision to limit the amount of controversial activity on campus in the name of public safety. For every peaceful protest the students engage in, there is a violent backlash that threatens the bodily safety of people at UCT. The least this writer can do is acknowledge the violent and destructive activity of the people he defends. Note as well that this kind of action gets threatened to cartoonists and artists in South Africa when their message goes against the status quo. Here, we have a group of ANC supporters threatening to climb into their busses and “visit” Zapiro and Mabulu because of their anti-ANC “tendencies”. One must hope these busses of knuckle dragging fascists don’t appear on the UCT campus, matches in hand.